This is a beautiful canvas wall art. I looked at it many times and finally decided to purchase it. I'm so glad I did as the colors match my great room to a tee. Very nice quality stretched canvas. Very happy. 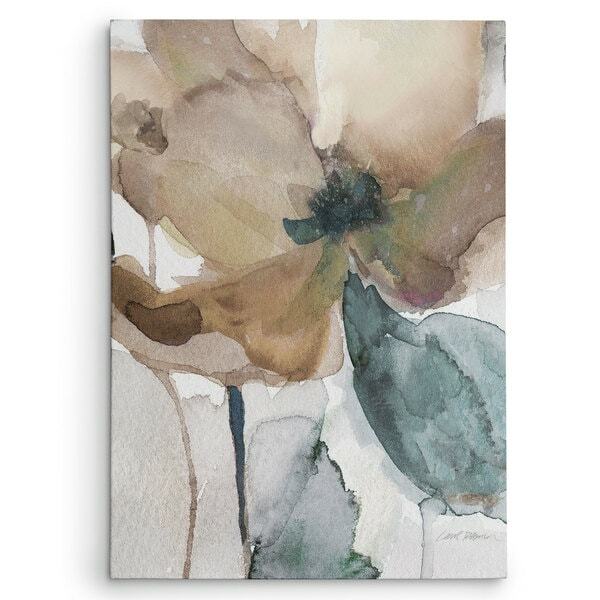 Featuring soft tones of taupe, brown, grey-blue, sand, and eggshell arrayed into lovely poppy flowers, this elegant wall art complements any space with natural beauty and artistic skill. The hand-wrapped canvas is easy to install, no frame required. Carol Robinson is a native of Salt Lake City, Utah, but through the whirlwinds of life, she has been relocated to Alberta, Canada, where she has learned to love small town life, embrace winter in all its glory, climb the Rocky Mountains on a weekly basis, and live and breathe hockey. Carol has always loved to draw and paint. Formal schooling took her through three years of university study only to gain an MRS Degree, acquire one wonderful husband, three fantastic children, five (and counting) grandchildren, assorted animals, and 26 years of learning to navigate the art world. Carol feels that through creating artwork for various clients, and keeping up with the hottest trends, she has grown more as a hands-on artist than she ever did as an art student. Lessons learned as a professional artist have been invaluable and stretched her abilities far beyond anything she could have imagined. Carol loves to experiment, and often combines many mediums with digital art to create her diverse looks. She has added photography to the mix and enjoys seeing the world anew through a lens as well as through her already keen artistic eye. Carol says that virtually everything I see can inspire a piece of artwork and it is a marvelous way to look at our world. Wanted the perfect color combo for my dining area. This one did it perfectly, The soft colors are true to the picture. This one has just the right shade of gray brown and teal. So many photos you see on line are not accurate. This one truly is... l love this piece! This is the most wonderful addition to my bedroom! The room has ivory colored velvet drapes and similar bedspread and pillows. Also, comforter matches the blue / brown on my perfect painting. I purchased the largest size available, 3' x 4'! Friends in my apartment building are amazed how well the large size suits my bedroom. I knew it would be terrific and I was right! 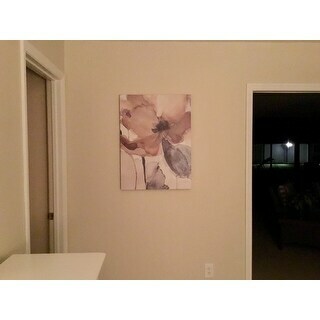 Love the Poppy I canvas artwork. I purchased this canvas to put in my dining room. I love the colors of tan and turquoise blue together and it fits well in the room. The painting is well made and feels to be sturdy for years to come. I am leased with this canvas and have already purchased Poppy II to go with it. In a word, I LOVE this piece. For me it is worthy of ten stars. The muted colors and abstract style make this piece serene and a pleasure to look at. I hung it in my bathroom on a creamy beige wall with other brown and green accents. The canvas is mounted on a wood frame making it sturdy but definitely not heavy. I looked for companion pieces by the same artist but could not find any :( I would HIGHLY recommend it to others. This is a beautiful piece of art. It matches every thing. The colors are true to the pictures. It's all I hoped it would be. Liked it so much that I ordered another one from the same artist. Price is much less than other sites and many more options. Thank you overstock. 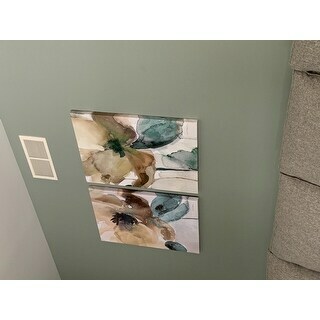 I purchased this one and Watercolor Poppy ll to put on each side of my fireplace over my small built-ins; they look beautiful! They came in 4 sizes and I picked the size that fits perfectly. The colors are a bit muted and look really good. I love it's done by an American artist. As soon as I can fine more wall space; I'll be in the market for another one of her works! Already receiving lots of compliments. Art received on time and in great condition. It has beautiful muted colors, just what I wonted. It is a little more green than the computer displayed it to be, and it is in the area which looked mostly taupe and gray. but it still works well with my decor. so I love it. 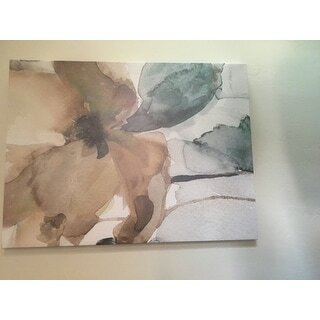 I know own both I and II of the Watercolor Poppy Multicolor Canvan Artwork. I like the first one that I bought so much that I bought the second and will be utilizing both within the same space. The colors are very nice, not bright, not dull but just the right balance. I would recommend this artwork to anyone wanting flowered canvas artwork. 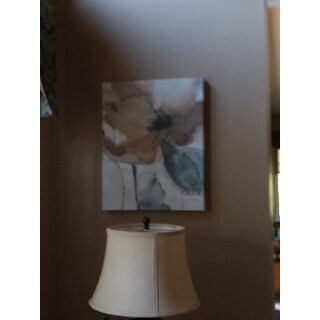 I purchased the large 3' x 4' and it hangs over the fireplace - I have very tall ceilings. The teal is the accent color in my room and it just brings it altogether. 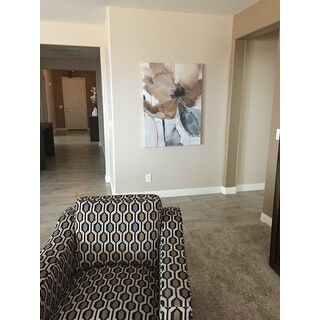 The painting is soft and soothing - really a positive addition to the décor . . . very satisfied. It is a pretty picture and the colors match my decor perfectly, but it is very lightweight and 2 of the wood braces were split when it arrived. I repaired the wood braces myself and hung it anyway because the colors were so perfect. Not the highest quality wall hanging. Beautiful! The soft neutral tones are a perfect accent to the linen painted walls. I purchased the companion print and happy with the purchase, would recommend to anyone who is looking for color without being stuffy! Looks great with my cream and gray room. the color is very subtle and very stylish. I put it at the wall between my dinning room and my living room. I have a navy blue couches and it matches. Looks beautiful in my bathroom. I bought this to match another and I love it. I wanted something soft to go in a light grey bathroom we had just remodeled. Helps give color without overpowering. Highly recommend. This is such a beautiful print! I am using this with the matching print Poppy II. I am stacking the pictures in my hall going into a bedroom with the aqua, gray, and brown colors. It really flows into the room style and colors. I love canvas prints because they are so easy to hang and no glass to clean too! This item arrived just as expected! It works perfectly (style and colors) for a large wall in my living room. I am looking forward to enjoying it for years to come. "Love this, but does it look like stretched cheap contact paper stretched over a frame of wood? Or is it great quality?" It is an affordable quality print. This artwork is available in multiple sizes. Please use the options menu to make your selection.